Welcome to the Dee Dee Thai Spa! A wellness luxury spa resort dedicated to inspiring Life in Balance. Being physically and mentally healthy is the most importance in life. Being ill or not feeling well can drastically affect your work. Obviously, if you feel physically and mentally healthy, you can be more productive and you can enjoy your life simultaneously. 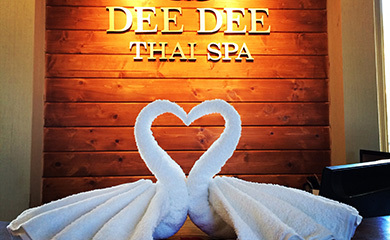 Dee Dee Thai Spa SM wants to promote healthy lives. Our number one goal is to ensure that you have a healthy and productive life experience. 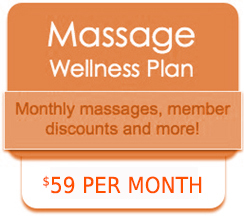 Sign up to receive a FREE massage and exclusive membership perks! 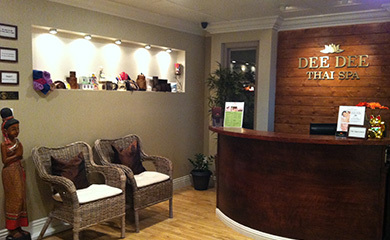 Become a member of our Wellness Program and earn all benefits every time you visit Dee Dee Thai Spa SM. Purchase Gift Certificates are now available online!!! Please inform us when making an appointment in which you will be redeeming a gift certificate and provide us with the certificate number. Gift Certificates must be presented at the time of service. No refunds, exchanges, transfers or substitutions are allowed. Gift Certificates have no cash value and are non-refundable. No cash or refund will be provided for services not used. No change will be given. Gift Certificates are only redeemable at Dee Dee Thai Spa SM for the amount or service specified on the gift certificate for up to 1 year from the date of purchase. 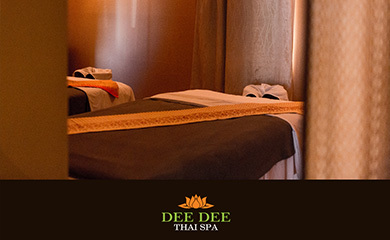 Dee Dee Thai Spa SM reserves the right to convert service-based gift certificates to their monetary value, equivalent to what was paid for the gift certificate, at its option and sole discretion. We do not allow service specified gift certificates to be divided among visits. 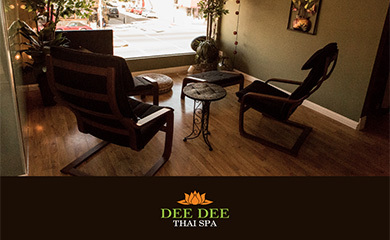 If your Gift Certificate is lost or stolen, immediately call Dee Dee Thai Spa SM 562-434-5100. Your Gift Certificate will be canceled and we will issue a new one with the remaining balance or service. Dee Dee Thai Spa SM shall have no liability to you for lost or stolen Gift Certificate or use of any Gift Certificate by third parties. 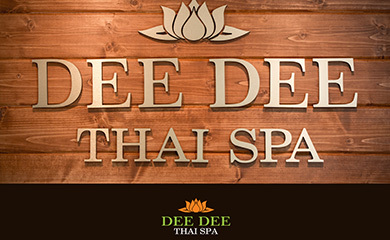 Dee Dee Thai Spa SM reserves the right to refuse service or reverse any gift certificate purchase for any reason and return the funds to the purchaser. Any cancellation with less than 24 hours of notice subject to a cancellation fee amount into the cost of the schedule services. A peaceful and warm place to walk in to. Everyone's very welcoming and friendly. Would definitely come back and refer my friends..another plus was the couples massage room that I never knew about.. I had the combination massage for 1.5 hours..love being stepped on- keeps it different without feeling so repetitive with the movements. Thanks Malee! I've been here around 10 times over the span of the last 2 years or so. Every time has been a positive and very relaxing experience. Very clean environment, comfortable beds with warmers, and a nice amount of options to customize your massage. I've mostly had work done by Kathy who has heavy hands and gives a great deep tissue massage. Strongly recommend this place! Pricing is very fair! Lena was amazing! I dance, so my legs and feet are so stiff and she really did a great job. Very clean..soothing facility just hidden off the streets. Everyone was very nice there. Will definitely go back! To preserve our tranquil environment please use your spa voice and silence your cell phone upon check-in so it does not disturb others. Place your belonging in the cabinet. Dee Dee Thai Spa SM is not responsible for valuables lost or left at the spa. Our spa service prices do not include gratuities. Any gratuity given to your service provider is at your discretion. If you would like, the spa concierge can assist you with extending a gratuity to your therapist or service provider. We exist for your well being and are here to guide you in choosing the ideal spa treatment(s) for your personalized experience and to achieve your desired results. While making your reservation, please inform the spa concierge of any medical conditions such as pregnancy, high blood pressure, heart conditions, known allergies or special needs that require our attention so we can ensure your experience is a pleasant one. Please feel free to contact the spa with any questions concerning the treatments you are interested in choosing for your spa visit. Please keep in mind that arriving late for a service may require us to shorten the length of the treatment, with full charges applying, so as not to inconvenience other guests. We regret that late arrivals will not receive an extension of scheduled appointments. We respect your time and appreciate your choice to spend it with us at Dee Dee Thai Spa SM. We do NOT charge for rescheduling or cancellations. However, please kindly let us know of changes or cancellations 24 hours before your appointment. For online promotion, no call or no shows forfeit the promotional value, but can still use the face value of the voucher towards services. Dee Dee Thai Spa SM is a pollution free zone, therefore smoking is prohibited anywhere on our premises. Please understand that we are meant to serve as a place to relax and pamper yourself. Hence, the use of mobile phones in the facility is highly discouraged. 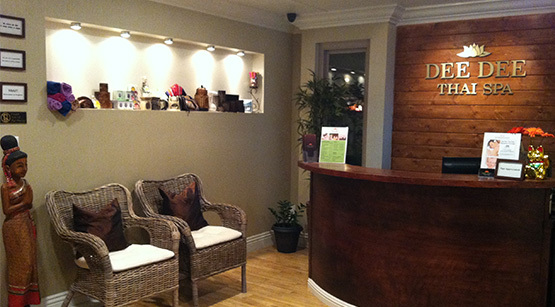 Dee Dee Thai Spa SM's professional therapists and estheticians are certified by the State of California. All massages are therapeutically oriented and non-sexual. Any remarks or gestures made by a client and interpreted by the therapist as harassment or sexual in nature will result in the immediate termination of the session, and the client will be liable for full payment of the scheduled appointment. Dee Dee Thai Spa SM reserves the right to refuse service to anyone. Ancient healing art for full body massage blending practitioner-specific modalities, deep tissue work and yoga-like body passive stretching allow energy flow and balancing experience. Performed as a full body relaxation massage that incorporates long flowing strokes, kneading and friction techniques. It is excellent for improving circulation, increasing range of motion, relieving muscle tension and promoting health and well being. The intent of deep tissue is to release muscles from chronic holding patterns resulting from injury or fatigue. When chronic tension is released, muscles return to their aligned position, and bones fall to the correct posture. This work can be intense and may cause some soreness afterwards which can be soothed by using ice packs. Great treatment for Pre-Event to complement a warm-up and prepare the muscles for intense activity. Post-Event to flush lactic acid that built up during the activity to help prevent muscle soreness, cramps or spasms, and also help to promote rapid removal of waste and toxins that have built up in the muscles from the recent exertion. Massage during pregnancy gives the mother-to-be the special attention that she needs during this very special time. Pregnancy massage differs from regular massage in terms of positioning, but is no less as enjoyable and beneficial. You will be in a semi-reclined position which is both comfortable for you and safe for the baby. You will be turned from side to side with the support of pillows to work the back and hips. Clients seeking pregnancy massage must be past their first trimester. If you are experiencing any complications, risks or abnormal conditions during your pregnancy, a doctor’s approval for a massage may be requested. May incorporate a variety of elements such as Swedish massage techniques, acupressure, trigger point therapy, stretching, range of motion, and energy work to arrive at a treatment that is totally individualized to each client and reflects the uniqueness of each therapist to provide an experience of utter relaxation. Cranial sacral release therapy is a very gentle and non-invasive form of massage that works with the cranial bones, the spinal column and the sacrum to balance energy as well as the flow of cranial sacral fluid. Often used to treat headaches, restlessness, insomnia, sinus pressure and ear aches. Pressure point reflexes in the hands and feet that correspond to every part, organ and gland in the body to improve circulation, detoxification, and to reduce tension and the body's ability to heal itself. Designed to relieve tension, stress, headache, migraines and tightness of the muscles surrounding the skull. Make it a health break, during lunch, before work or after work. Your health, your time! Stone massage enhances the standard massage technique. The heated basalt stones when placed on or used to stroke the body warms the muscles helping the therapist to work deeper into the tissues, and therefore, increases the release of toxins, reducing muscle stiffness, tension and inflammation. The herbs in the ball will help soothing sore and aching muscles, relieving stiffness in the joints, promoting better breathing with camphor and menthol, and also brings the skin to a new level of regeneration. Focusing on individual’s skin care needs. This treatment cleanses, relaxes and rejuvenates. Anti-aging facials use products and technique designed to slow the aging process, brighten skin, and reduce wrinkles. The facial includes cleanse, steam, exfoliation, extractions (if desired), skin plumping serum with facial toning massage and anti-aging mask. Staring with basic facial customized for you skin type aimed at improving and rejuvenating the skin through the use of deep cleansing, massage, masks and exfoliation and ended with face, neck, shoulders and scalp massage for the ultimate indulgence. This treatment addresses issues of ingrown hairs, razor burns and over active oil glands. Includes men scrub and is a great way to introduce men into daily routine. A deep cleansing treatment that thoroughly exfoliates and removes impurities from difficult to reach areas, leaves your back feeling silky smooth and polished. 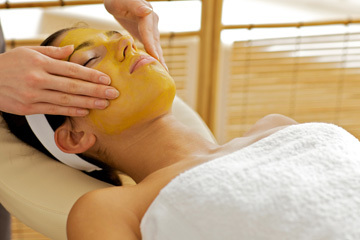 Includes deep cleansing, mask, extractions and massage. Perfect for looking good at the beach or in those strapless shirts.